This June, don’t miss the chance to meet Ms. Christine C Roa, author of Federic’s Flight (one of only two local books authored by mothers published on autism) as she facilitates this month’s FSG. 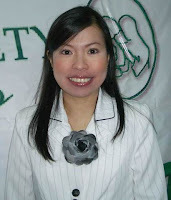 Mom Chrissy is a communication and education specialist, part owner of South Kids International School, and Program Consultant of Brighter Beginnings Daycare Center in Unilever, Phils. She served as ASP’s Vice President (2005 to 2007) and continues to contribute to the success of some of ASP’s major programs and events. “After Grade School, High School. After High School, College. After College, work. After work, eat chicken,” says her son Federic Christian. Fedi, now 14.5 years old is an incoming third year high school student at the New Era University. Hurry! Call now to register in the June 20 Family Support Group. Take home practical tips on parenting and how to advocate for your child with autism. Call 9266941 or 9298447 Only 15 seats available!